Educating resellers on the important differences between similar products. 3Com makes network interface cards (NICs) for client workstations and desktop systems, and server interface cards (SICs) for servers. While a NIC will connect a server to a network, SICs have special redundancy and software features that improve the reliability of the network connection–an important distinction when multiple users are connecting to the same server. 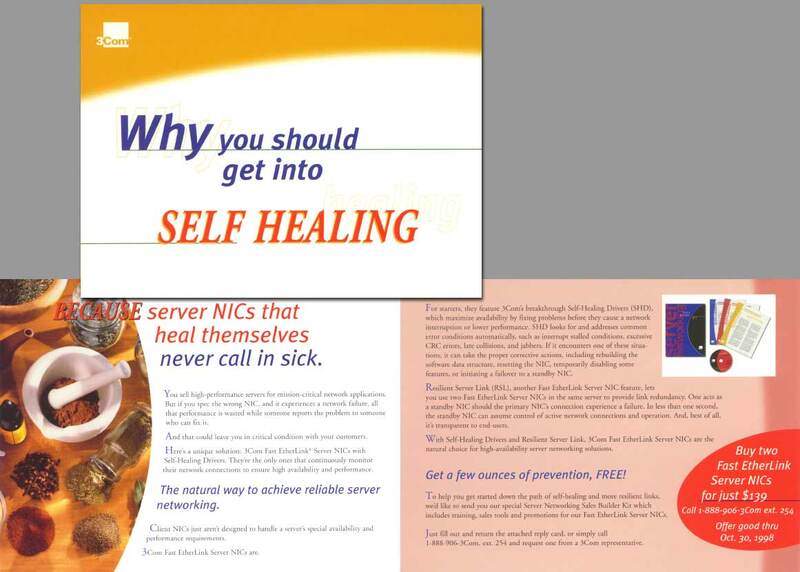 Unfortunately, because SICs cost more than NICs, and that cost had to be passed along to the end-user, 3Com found that resellers were specifying NICs in servers. When the overworked NICs dropped connections, customers wrongly blamed the 3Com product. The creative team (Orrell Communications and Wardog Creative) was approached by ChannelWorks—a channel marketing development company—with this challenge. 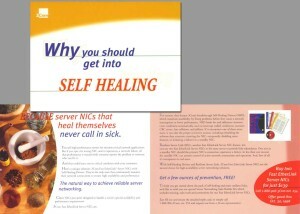 We developed a series of three self-mailers that focused on the features that made SICs unique and preferable to NICs for server applications.